Japanese Rose is a Natural material. Japanese Rose is a Medium priced Granite stone. Japanese Rose is mostly light/dark browns with black in it. This material will suit both traditional and more modern kitchen designs. 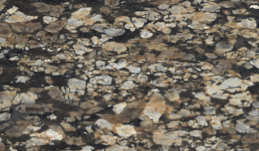 Its unique mottled appearance sets it apart from other granite worktops, standing out against pure white or cream units. Japanese Rose is a Natural Granite from India, Landford Stone offer this type of stone in a variety of thicknesses and finishes. Japanese Rose is a Medium priced stone and will look incredible in your home!